Due to the price tag placed on most boats, when you finally decide to invest in one, you should expect to have it around for the long haul. There is no prettier sight than seeing a new, polished boat out on the lot. Unfortunately, the paint job on your boat will not last as long as your boat itself. If you have a boat in Minnesota that works great but needs an exterior makeover, put your trust in our expert boat painting professionals at Anchor Marine Repair. Whether your old boat needs a new paint job, or you had an accident in your new boat that requires you to get some paint touch ups, our team has you covered. With over 45 years of combined experience, our staff has earned the reputation as being the #1 repair shop in Minneapolis. That recognition comes from always keeping our customers needs first in our business. After all, our success as a boat repair shop solely depends on our customers. We strive to repair and paint your boat so that when we are done with its makeover, it looks better than it did pre-accident. When it comes to a new paint job, we often find that people put this work off because they don’t want to have to deal with the hassle of getting it to the shop. Well, at Anchor Marine Repair, we have a solution! Our team offers complimentary pickup and delivery services to our customers within a 250 mile radius of the Minneapolis and St. Paul, MN area. 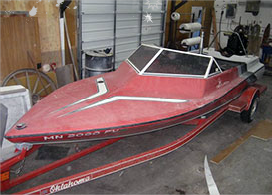 Not satisfied with your current boat? 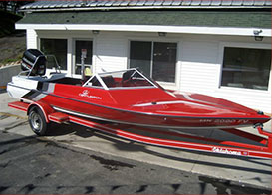 Do you miss the feeling you had when you first bought your boat and its paint job was pristine? If you are thinking about getting a new boat just because you are dissatisfied with its current look, consider a new paint job first. Boats are a large investment. If you love everything else about your boat, then why not have our dedicated team apply a new paint job to your existing boat? Once our team is done painting your boat, you’ll feel like you have a new boat, and you’ll only have to pay a fraction of the cost of a new boat! What is great about our staff at Anchor Marine Repair is that we love to listen to your ideas and can accomplish whatever new look you are going for. Before you say goodbye to your fully functioning boat because it looks dated, consider investing in a new paint job on your boat instead. To set up a free estimate and consultation with one of our dedicated team members in Minnesota, give Anchor Marine Repair a call today at (763) 972-3540.